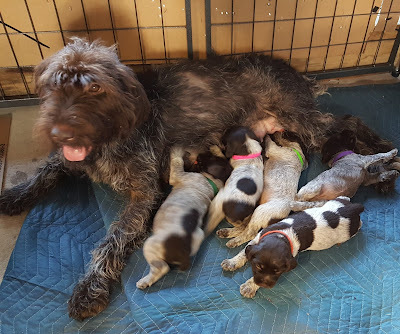 Tail-wagging adventures at Freedom Point - Unique Wirehaired Pointing Griffons in Florida! We have notified our existing waiting list and respectfully given them 48 hours to respond. Please complete a puppy application to be added to our list. After 48 hours, we will review new applications and conduct interviews if puppies are available. Medium sized and bred to cover all terrain encountered by the walking hunter, the Wirehaired Pointing Griffon has been called the "4-wheel drive of hunting dogs" as he will enter briars or underbrush without hesitation. Griffs excel equally as pointers in the field and as retrievers in the water. Their coarse double coat protects them in rough cover and gives them an unkempt appearance. It can be a variety of colors, most often steel gray with brown markings. Amy Polk. Watermark theme. Powered by Blogger.